Pop culture icon and scientific genius Stephen Hawking best known for his book A Brief History of Time has always been seen trapped in his ALS tortured body speaking from a computer interface. People don't necessarily think about Hawking before having active life before he became disabled. His ex-wife's memoir Travelling to Infinity:My Life with Stephen is the basis of the new movie directed by James March (Project Nim and Man on a Wire) with a screenplay by Anthony McCarten. The story covers his time at the University in Cambridge, England during the 1960's, the romance, his sickness, and his ultimate fame. Eddie Redmayne's performance as Hawking is already garnering accolades with suggestions for the awards season. Hawking (Redmayne) was a brilliant PHD candidate, but he had not settled on the choice of his discipline until he hears a seminar from mathematician Roger Penrose who inspires his exploration of gravitational singularity theorems. While his resulting PHD theory is considered brilliant, the movie is mostly about the relationship he has with Jane (Felicity Jones), a French and Spanish Major. There's an immediate attraction between Hawking and Jane despite their disagreements on religion. After he is diagnosed and only given two more years to live he struggles with depression. But Jane steadfastly keeps him going and decides to marry him. They are romantically happy, having babies, and Hawking continues with his work which over the years brings him much acclaim. ALS may damage his body, but his brain remains active and engaged. Jane has put off her own field of study to care for the increasing demands on her husband's care and that of her children. But she battles on, until her mother suggests joining the choir at the church. It gives her time away from the stress at home and also introduces her to the handsome choir director Jonathan Hellyer Jones (Charlie Cox). 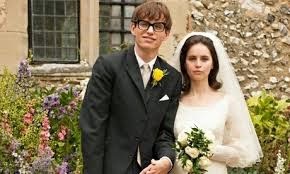 Hawking realizes that his wife needs help and they agree to have Jonathan become part of their family. Although Hawking and Jane's parents can see the writing on the wall, the introduction of the new nurse Elaine (Maxine Peake), and the demand for Hawking's lecture tours, the long suffering couple inevitably decide to part. The passage of time is told through the changes in fashion, the costume design is really highlighted in this movie going from the 1960's until the 1990's. As well as Hawking's gradual physical deterioration from stumbling, to having to use a wheelchair, to losing the ability to communicate. Redmayne's portrayal of Hawking through these stages will draw comparison's to Daniel Day-Lewis in My Left Foot. The slurred speech patterns and physical contortions he had to endure brings the Stephen Hawking to life. Felicity Jones, while not as showy as Remayne, gives a strong performance as the ever suffering wife who stands by her man. Wish there was more science involved, but this is basically a love story and a story of human endurance of a brilliant mind.